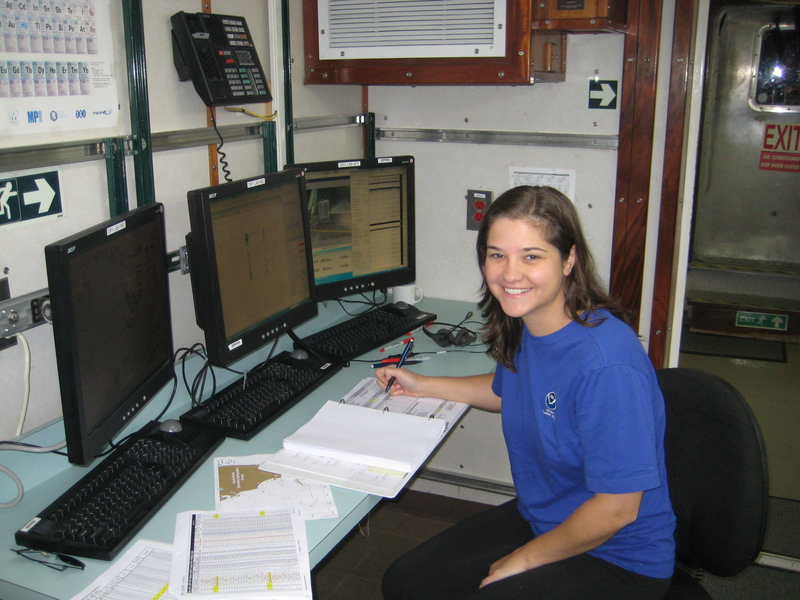 This entry was posted in 2011, Elizabeth Bullock, NOAA, NOAA Research, NOAA Teacher at Sea and tagged algae populations, CTD, currents, displacement method, moon jelly, Neuston net, R/V Walton Smith, safety, Sargassum, Walton Smith. Bookmark the permalink. Hi Ben, Taylor, and Josh! We actually all had gloves on, so we were protected from the jelly fish. Hi again. I found out today that moon jellies have such a mild sting, that we wouldn’t be hurt if we touched them. Since we didn’t know what else we would find in the neutson net, we wore gloves as a precaution. Safety first! If there is algae growing on the surface how long does it take for the plankton to die underneath? Algae can actually be considered a type of plankton. However, there are many types of plankton that are not algae. Plankton and algae both live in the top few feet of the water. They don’t sink farther than the light can penetrate. 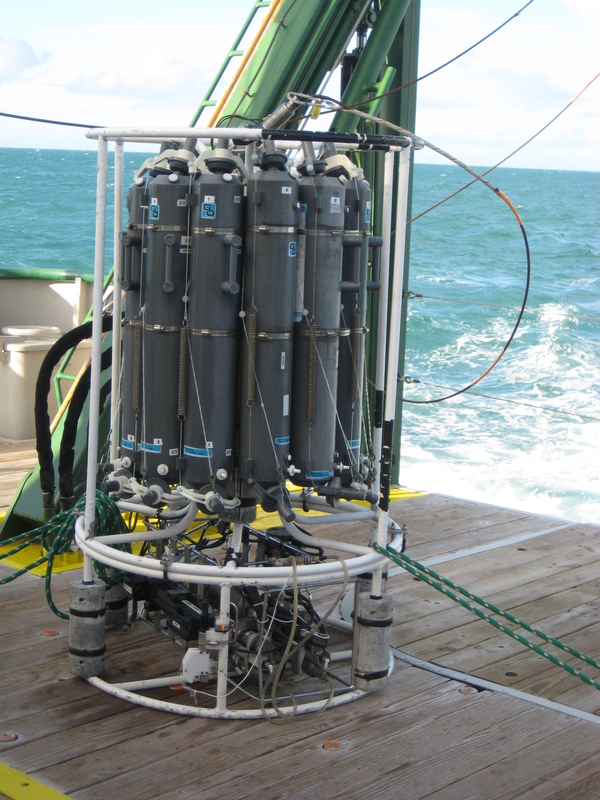 Since they float with the current (that’s what the word plankton means – floating) they will move around a lot. The different species might compete with each other, but it’s not generally enough to make an entire species die off. Good job, Anil! There are many different ions in salt water. That’s why we are able to measure conductivity. 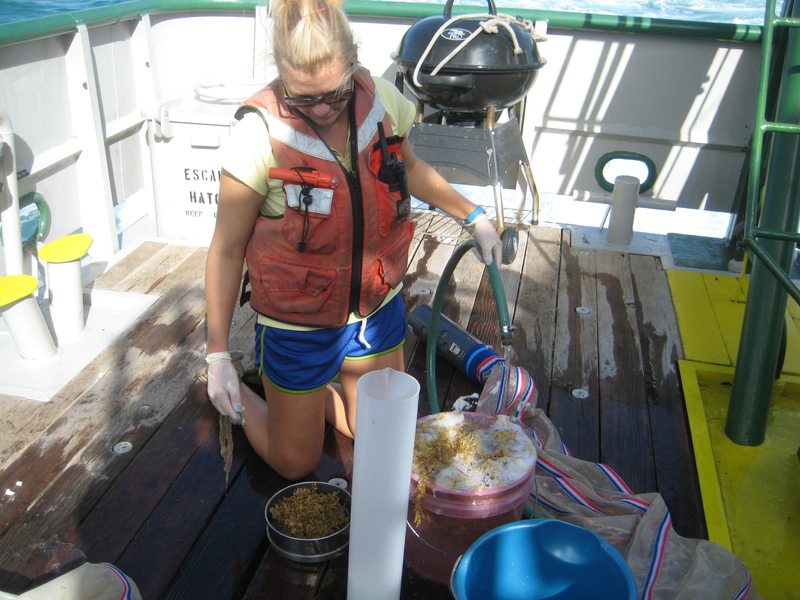 What does the Sargassum have in it. Is it like the zooplankton? How do you navigate the ship?? Do you use a GNSS receiver? If so, what type of receiver? Do you use a compass and stars? That would be rad…. Hi Peter! Captain tells me that they use a SeaMap charting system, as well as a Nobeltec charting software to back up the SeaMap. They can also use Nobeltec for voyage planning. They have 5 global positioning systems (GPSs) on the boat. The AIS (automatic identification system) they have is required on some vessels. They are also required to have paper nautical charts and a magnetic compass. For those students out there who are interested in ship navigation, learning how to use a GPS is important, but knowing how to use paper nautical charts and a compass is also crucial. When salt is added to electrical conductivity it increases, so you should get out of the water even faster if lightning strike the ocean compared to lightning striking the pool. When more salt is added to water, the electrical conductivity rises because the salt dissolves into both positively and negatively charged ions which are then attracted to their oppositely charged electrical current. Also, if more salt is added in the water, the electrical conductivity will become more electrical which can cause preoblems. Is there a specific time when the electrical conductivity is at its highest point in an ocean or sea? If the conductivity is highest, that means the salinity is highest. Surface water is most saline when it is hot, because the freshwater evaporates off the surface. For example, in the Chesapeake Bay, the water is its most saline in the summer months (especially if it hasn’t rained in a while). On a global scale, hot places such as right along the equator have the most saline surface water. What is the relationship between salt and electrical conductivity? Water is made up out of two elements that are hydrogen and oxygen. Distilled water is pure and has no salts, making it very poor conductor of electricity. If you add just original table salt to the distilled water it truns into an electrolyte solution, making available to conduct electricity. How long have you been studying this topic? Water is made up of two elements called hydrogen and oxygen. Pure water that is free of salt is called distilled water. That is why it is a poor conductor of electricity. An electrolyte soluction can condct electricity. This happens by adding origional table salt and distilled water. Were you interested in this subject when you were a kid? If not what did you want to be? How did it gorw into being your carrer? Distill water does not have any salt in it. If distill water does not have salt then it is a very poor conductor of electricity. If someone was to add table salt to distill water then it wwill bbe able to conduct electricity. Ionic compounds such as salt water, conduct electricity when they disolve in water. When did you decide that you wanted to do this? Water is ,made up of two elements: hydrogen and oxygene. Pure water that does not contain salts is called distilled water. Therfore, its not the best conductor of electricity. Only an electrolyte solution can conduct electricity. This activates by mixing original table salt and distilled water. I would suggest working hard in school and pursuing what you love.